Raw \"Easy Peel\" Extra Large King Prawns. Raw "Easy Peel" Extra Large King Prawns. 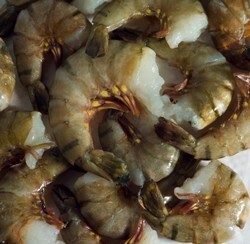 Uncooked head removed and De-veined Black Tiger Prawns that are big, juicy and meaty. Great for home grilling.